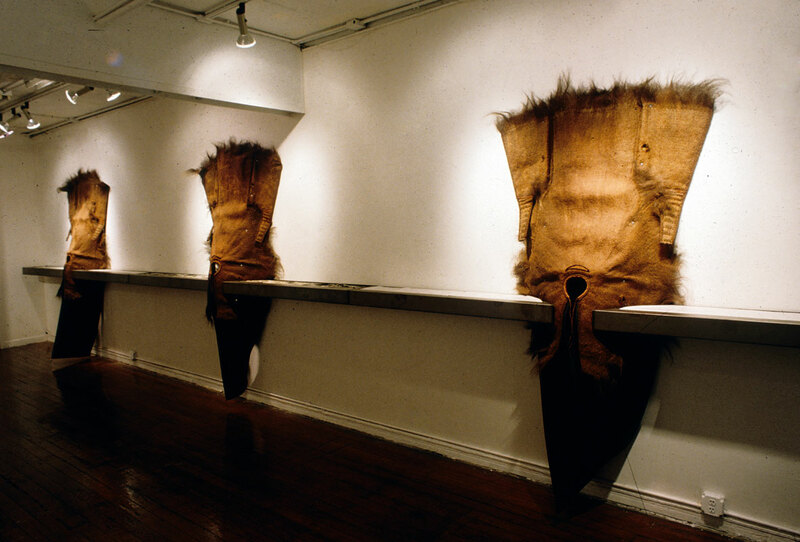 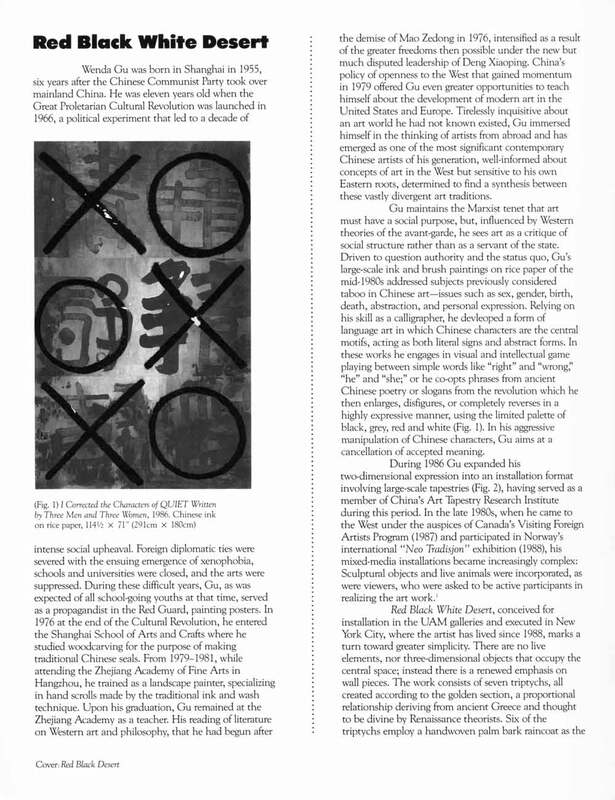 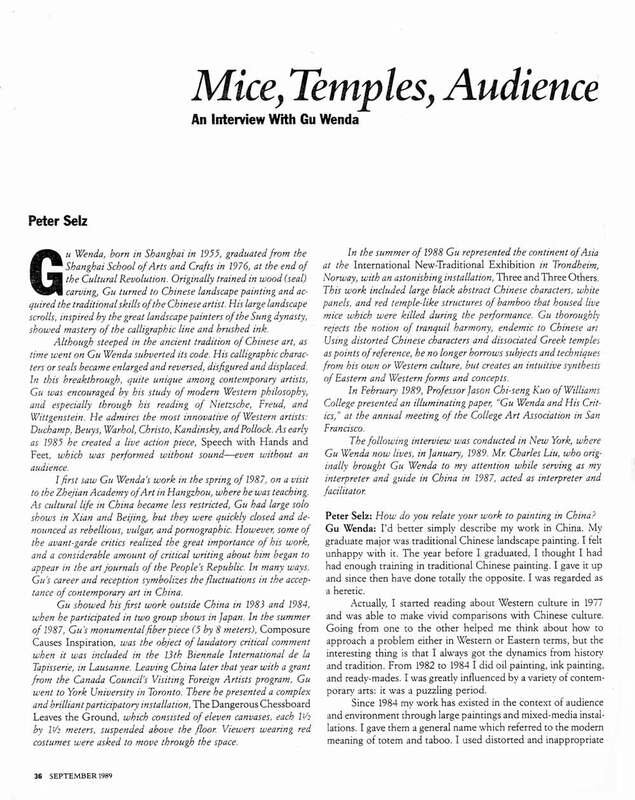 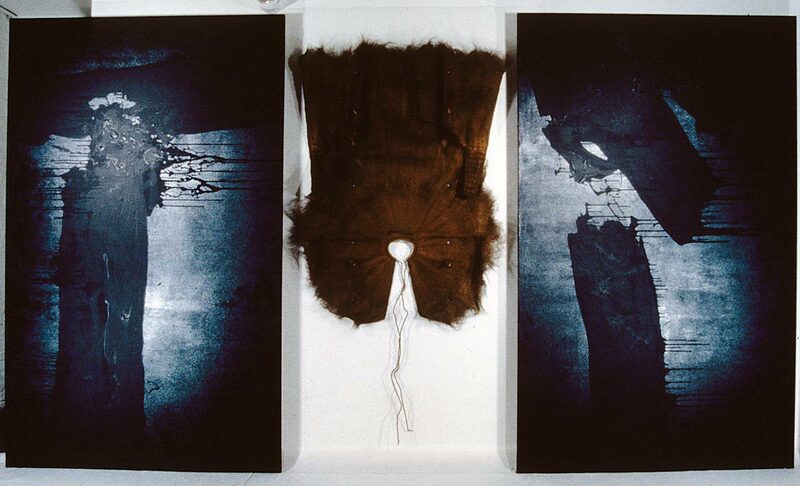 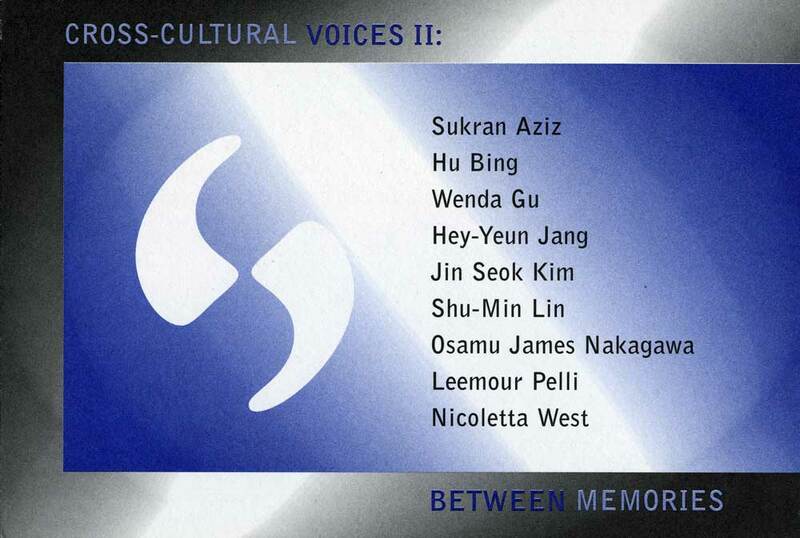 Excerpts from exhibition catalog for "Cross-Cultural Voices II: Between Memories" at Asian American Arts Centre, New York City, from Sept. 1-Oct.15, 1999, and at Stephen Gang Gallery, New York City, from Sept. 1-29, 1999, with artists Sukran Aziz, Bing Hu, Wenda Gu, Hey-Yeun Jang, Jin Seok Kim, Shu-Min Lin, Osamu James Nakagawa, Leemour Pelli, Nicoletta West. 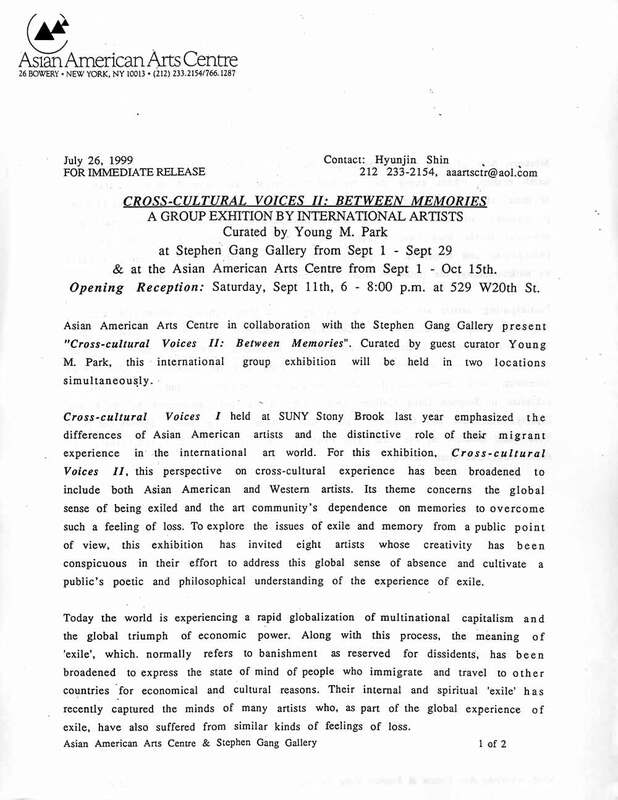 Exhibition flyer for "Cross-Cultural Voices II: Between Memories" at Asian American Arts Centre, New York City, from Sept. 1-Oct.15, 1999, and at Stephen Gang Gallery, New York City, from Sept. 1-29, 1999, with artists Sukran Aziz, Bing Hu, Wenda Gu, Hey-Yeun Jang, Jin Seok Kim, Shu-Min Lin, Osamu James Nakagawa, Leemour Pelli, Nicoletta West. 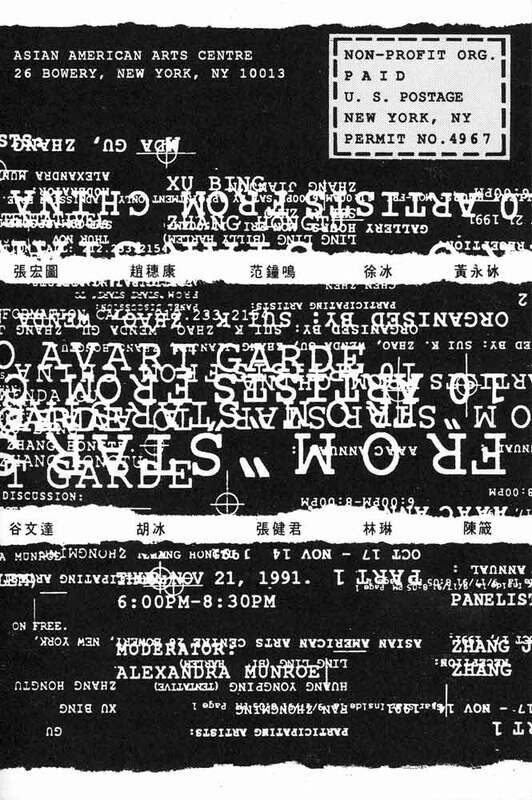 Exhibition flyer for "From 'Star Star' to Avant Garde: 10 Artists from China" at Asian American Arts Centre, New York City. 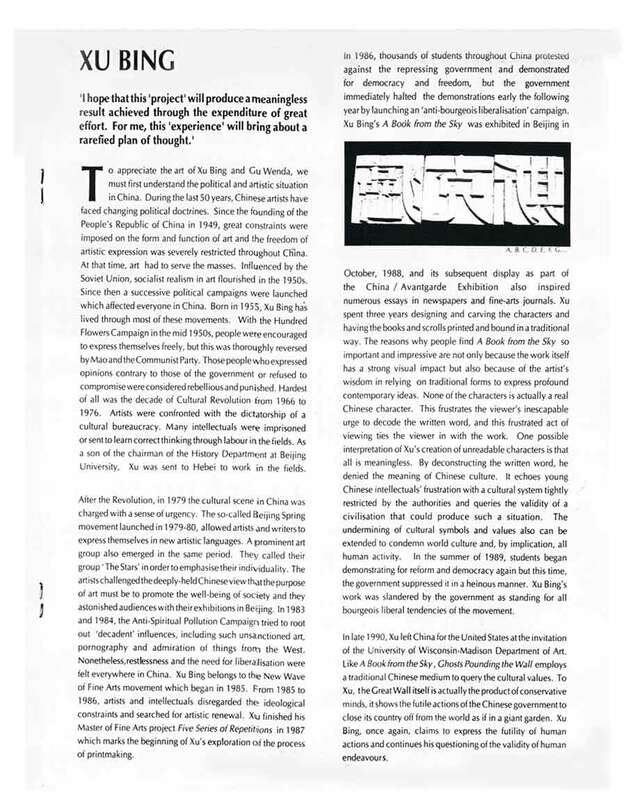 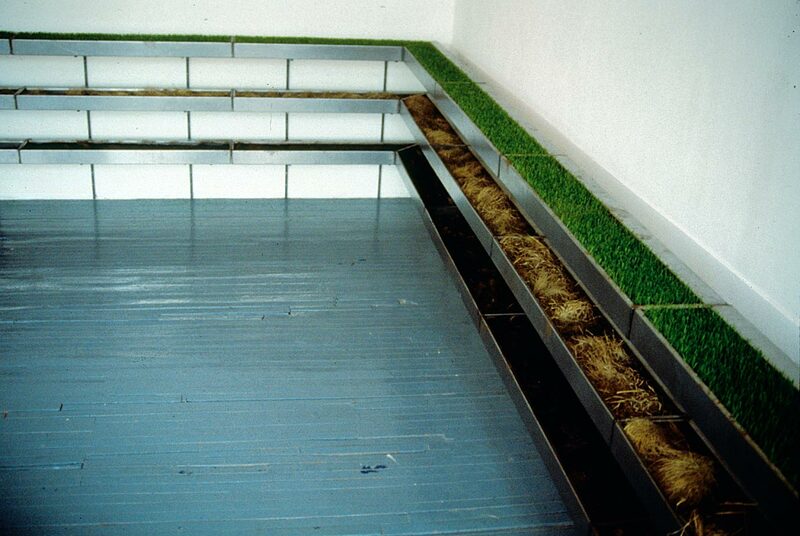 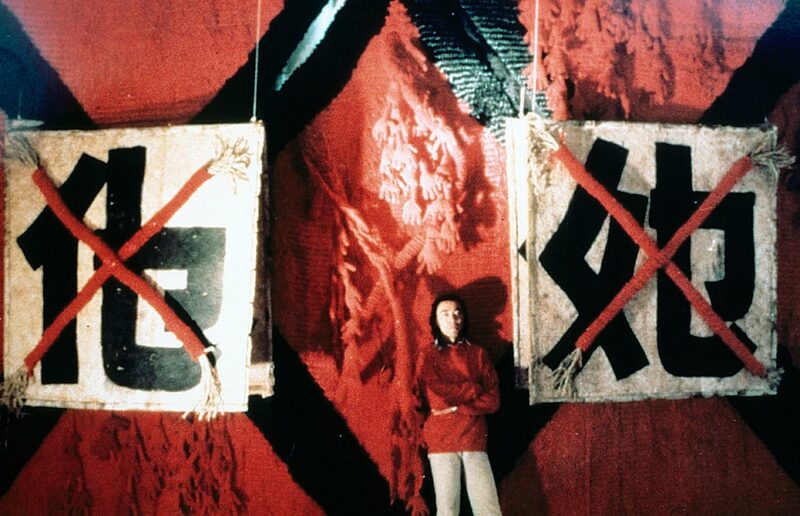 Part 1 from Oct. 17-Nov. 14, 1991, with artists Fan Zhongming, Huang Yongping, Ling Ling (Billy Harlem), Wenda Gu, Xu Bing, Zhang Hongtu; Part 2 from Nov. 21-Dec. 20, 1991, with artists Chen Zhen, Hu Bing, Ling Ling (Billy Harlem), Sui K. Zhao, Zhang Jianjun. 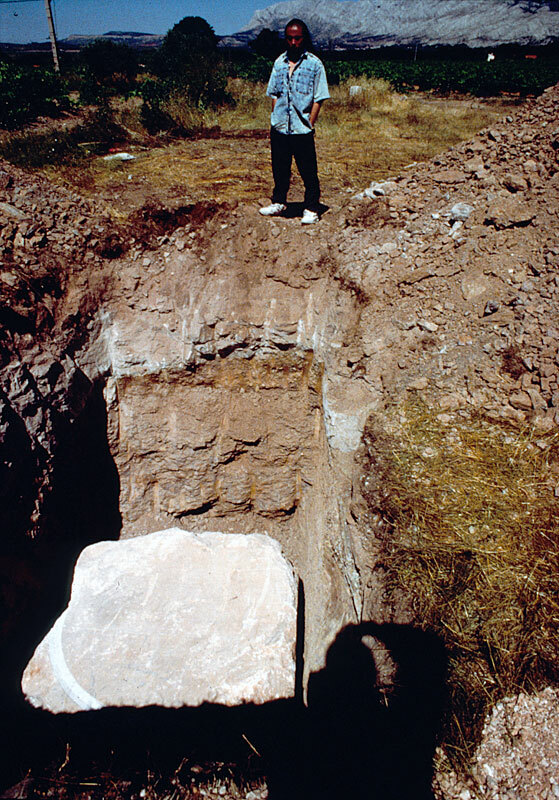 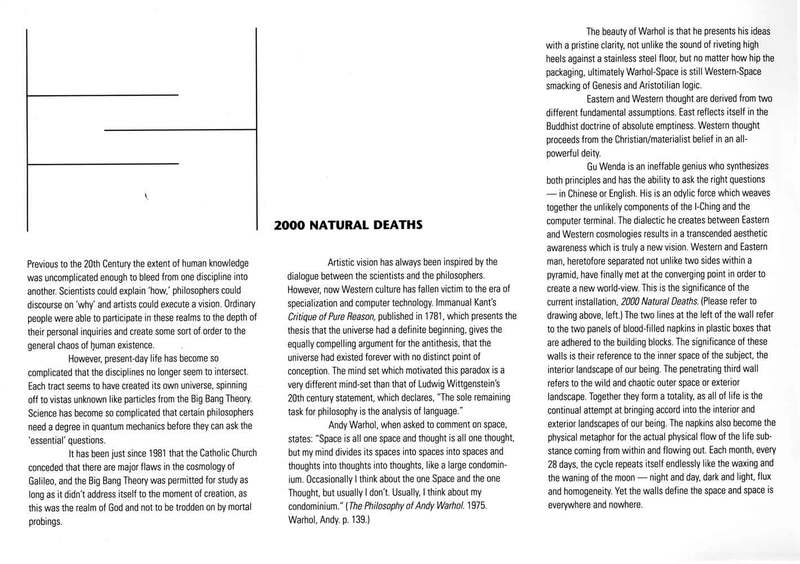 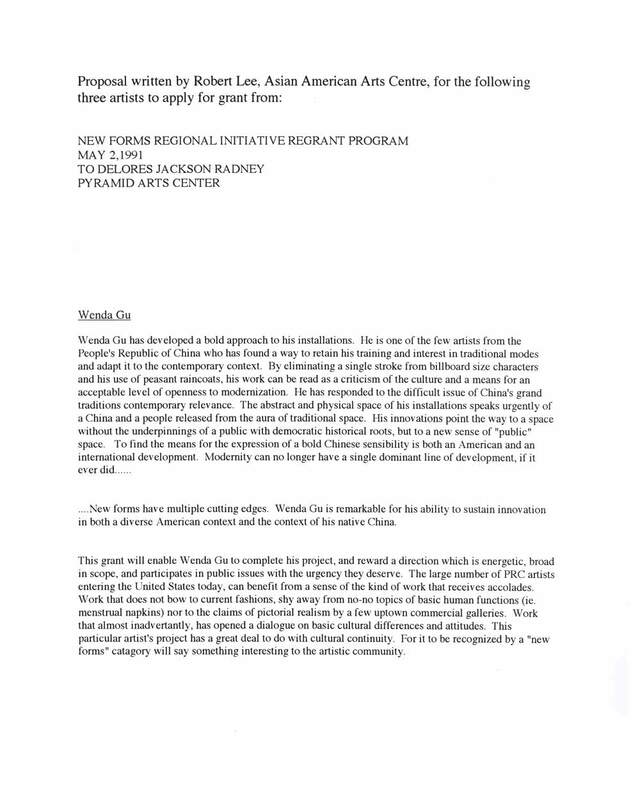 Excerpts from exhibition catalog for "Gu Wenda 2000 Natural Deaths" at Hatley Martin Gallery, San Francisco, from Mar. 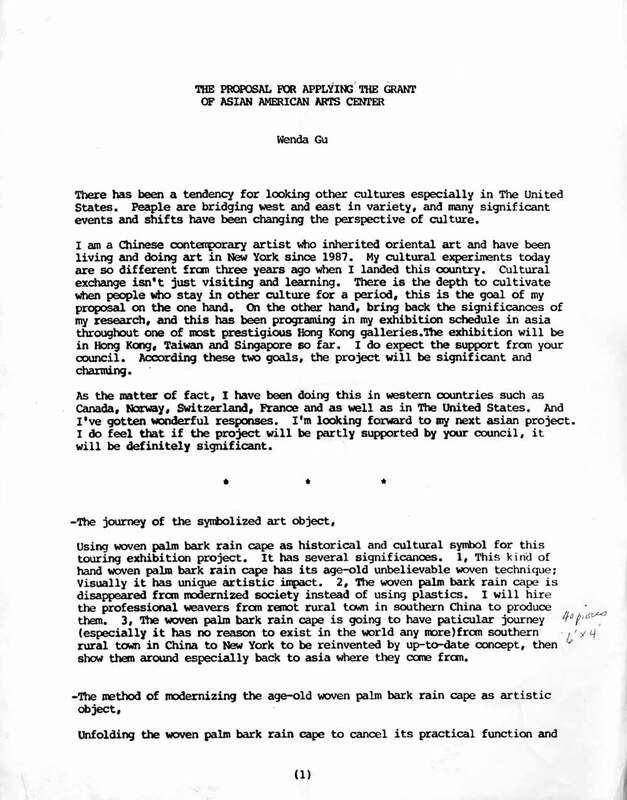 8-Apr. 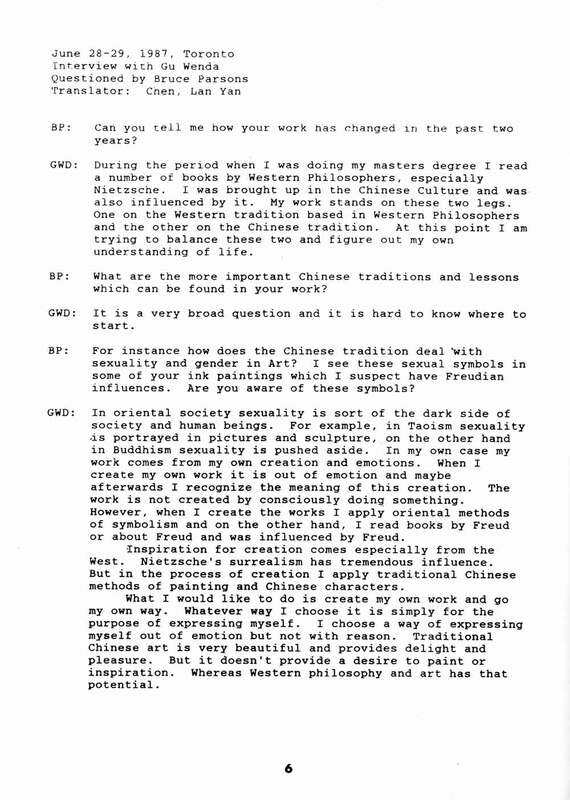 21, 1990. 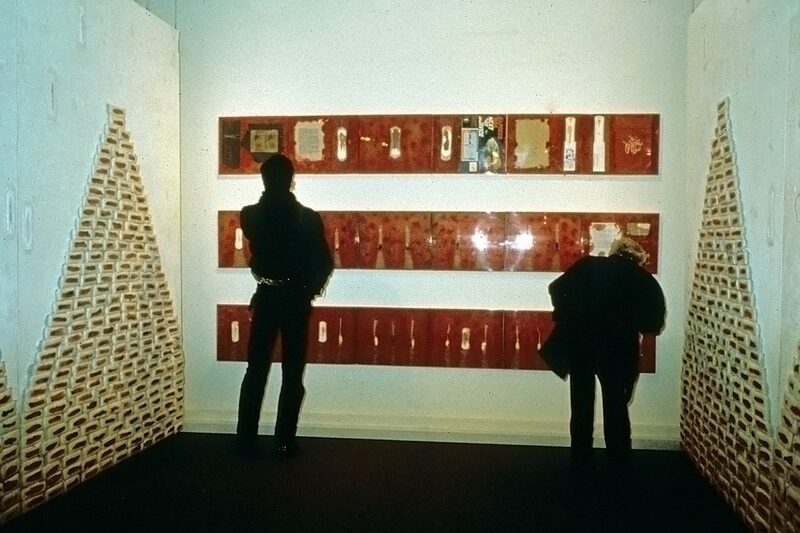 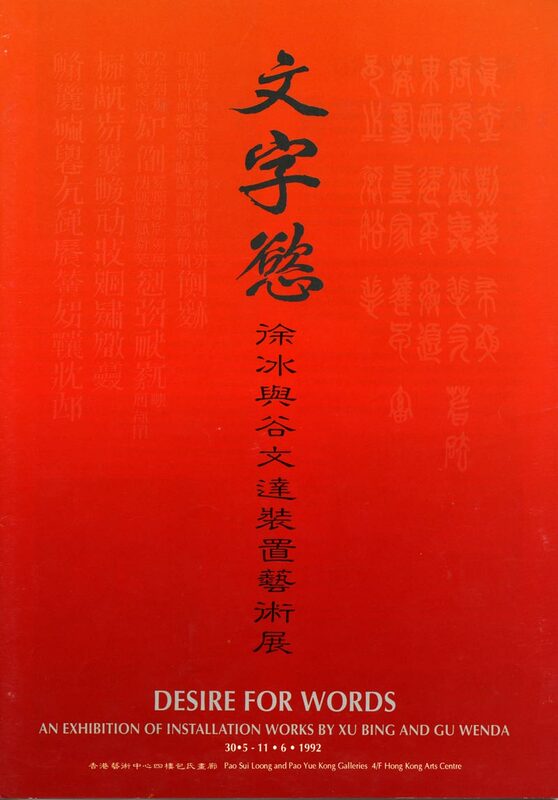 Exhibition brochure for "Desire for Words: an Exhibition of Installation Works by Xu Bing and Gu Wenda" at Hong Kong Arts Centre, Hong Kong, from May 30-June 11, 1992, with artists Xu Bing, Gu Wenda. 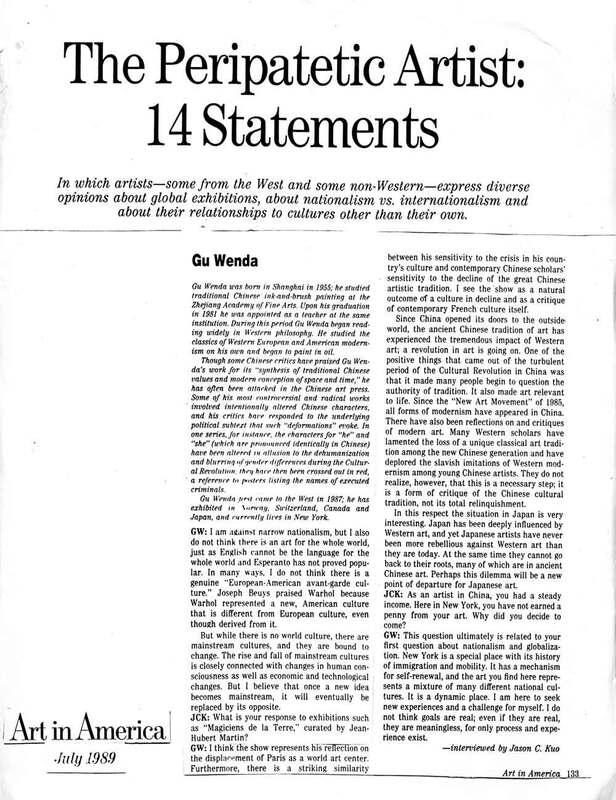 Excerpts from exhibition catalog for "Centric 40" at University Art Museum, California State University, Long Beach, from Aug. 31-Dec. 2, 1990.